Drum Corps International celebrated its 40th anniversary during the summer of 2012, with numerous special events held during the World Championships in Indianapolis. At the end of the season, two corps arguably had the most to celebrate; Blue Devils for winning their 15th DCI World Championship title to cap off an undefeated season, and the 12th place Crossmen, whose members heard their corps introduced at the Saturday-night Finals competition for the first time since 2004. Spirit of Atlanta's 11th-place "Sin City" production was named after the popular nickname for Las Vegas, a moniker referencing the abundance of adult entertainment across town that existed well before the "What happens in Vegas stays in Vegas" advertising campaign. Scenery depicting the Vegas Strip resorts across the front sideline and the sound of Frank Sinatra crooning through the speakers set the mood prior to the first note from the corps. Starting in a five-to-five-yard block formation of the corps' delta logo, with shocking yellow flags emblazoned with "Vegas" inside the form, the corps opened with a short fanfare statement of "Luck Be a Lady" from the Broadway musical, "Guys and Dolls." This led into music from the 1968 film "Bullitt," providing the musical stage that was all about walking the Strip and being surrounded by the excitement that is Vegas. "Bullitt" was a thriller that featured one of the greatest car chases in cinematic history. The movie, starring Steve McQueen, Robert Vaughn and Jacqueline Bisset, was based on Robert L. Fish's 1963 novel, "Mute Witness." The film's score was written for brass and percussion by Lalo Schifrin, a four-time Grammy Award-winning Argentinian better known for writing the theme to "Mission: Impossible." Also among his dozens of film scores are all of the "Dirty Harry" and "Rush Hour" movies. A showgirl, wearing the largest headdress ever seen in DCI competition, appeared during the introduction to "Luck Be a Lady." Frank Loesser wrote this piece for the 1950 musical, "Guys and Dolls," which was turned into a Hollywood film five years later. The plot of the musical is about petty New York criminals and professional gamblers in the late 1940s, but the corps' version was about seeing a Las Vegas floor show. The appearance of the bedazzled showgirl got most of the attention of the audience and generated some rather loud wolf whistles. The showgirl's costume—what there was of it—was a real Vegas costume. The headdress came from a shop that specifically makes them for Vegas acts. A series of fluorescent pink-feathered fans encircled her as she strutted down the field. "Poker Face," was a top hit song by Stefani Germanotta, better recognized throughout the known universe as Lady Gaga. The song started with a vocalist singing the lyrics, "I wanna hold 'em like they do in Texas, please/Fold 'em, let 'em, hit me, raise it, baby, stay with me." The piece was treated as a ballad, with two lovers holding back their emotions and then revealing their feelings when they finally allowed themselves to fall in love. The guard section was divided with half the members spinning flags decorated with the king from a deck of cards and the other half spinning flags with the queen. After the lovers came together, so did the king and queen on all the flags. The next piece was John Mackey's "Harvest: Concerto for Trombone," written in 2009 by commission of a consortium of 21 concert bands from high schools, universities and military academies. The concerto is based on Dionysus, the Greek god of the wine-producing vines and all the ecstasy that comes from imbibing in the drink. 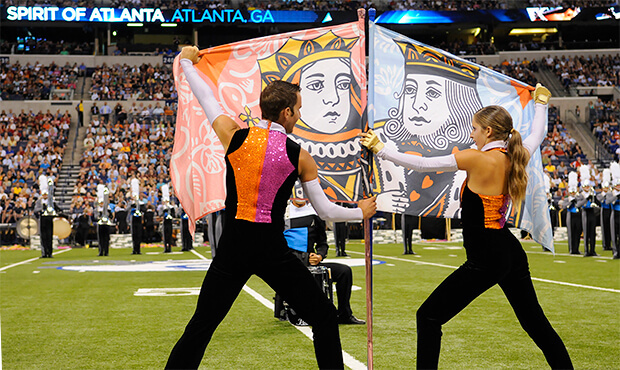 All about games of chance, one group of color guard members had flags depicting a royal flush and the other group had a roulette wheel printed on the flag silks. As the end of the show approached, sounds of slot machines filled the air and a reprise of "Luck By a Lady" found the corps going "all-in" with the poker chips, reaping a big payout as the featured high roller won a lot of cash and presented it to his "Poker Face" lover. The show ended with her fanning her face with the cash atop a stack of giant poker chip props. For this week only, you can save on the DVD that contains this complete Spirit of Atlanta performance, along with all of the finalist corps at the 2012 DCI World Championship. Buy the 2012 World Championship DVD set. (Available this week only for 20% off. Regular price: $79.95.) Discount DVD offer ends Monday, April 8.